Anyways, here's this week's video. It's not only about FF4, but about the whole Final Fantasy series in general. Enjoy! And how did the first big Super Nintendo fare in the 21st century? 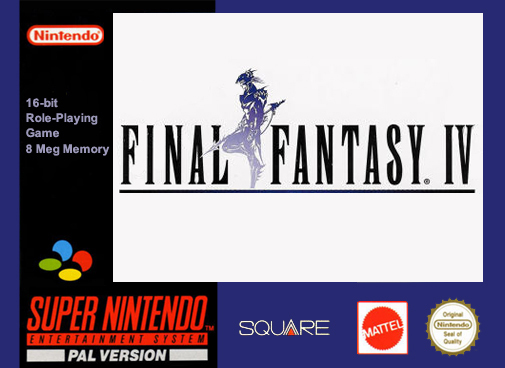 So here's an idea to open up a can of worms: What is the best Final Fantasy game and why? For me personally, the series' Renaissance was between FF6 and FF9. I found FF10 and FF13 to be pretty disappointing (still good games, but definitely not my favourites) and FF12 to be a fantastic, although very uncharacteristic entry in the series. As for FF11... well, Irvyne was a resident Hume in Vana'diel for over 3 years, so I guess that counts for something... I've only played FF14 very breifly, so can't really give an opinion on that yet. 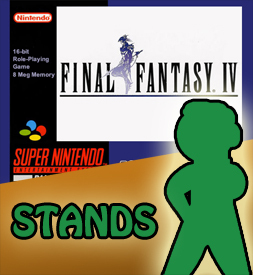 FF4 and FF5 are good, and the earlier games are fairly bland, but still surprisingly playable. I've played through all of the first three games in the last couple of years, and enjoyed them all, much to my surprise. What about FFX and X-2?